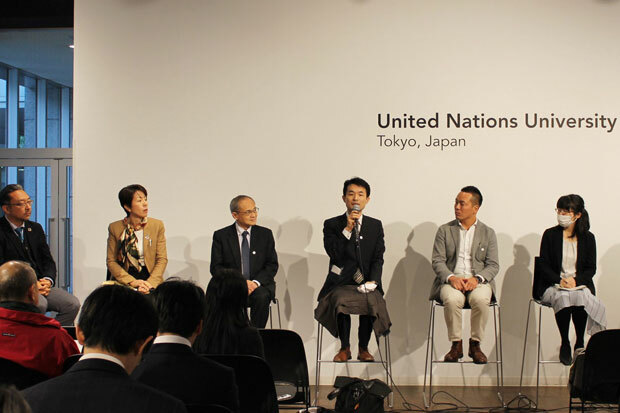 On 24 January 2019, UNU-IAS and Wetlands International Japan co-organized a symposium to observe World Wetlands Day (WWD) 2019. This year’s theme for WWD is “Wetlands and Climate Change”, and six speakers gave presentations on that theme based on their own research/projects and experiences. First, Hiromi Masuda, UNU-IAS Programme Coordinator, explained global trends regarding the SDGs by introducing international discussions regarding development and the environment. She also presented a report which highlights the critical role of wetlands in relation to each SDG. Daigo Ichikawa of the World Wildlife Fund (WWF) shared that, due to the impacts of climate change, the number of species included on the IUCN Red List of Threatened Species has been continuously growing. He also reported on the Talanoa Dialogue and the adoption of the Paris Rulebook at COP24. Naoki Kumagai from the Center for Climate Change Adaptation, National Institute for Environmental Studies, pointed out that his research indicates that climate change has led to coral beaching and seaweed withering in summer and stressed the importance of conserving seaweed. Hokkaido University Professor Toshio Iwakuma introduced a comprehensive survey of Oze (a national park spanning Fukushima, Tochigi, Gunma and Niigata Prefectures) and data analysis of Yubara and Oze Observation Points, highlighting the change of rainfall patterns, which is affecting the Oze environment. Hiroko Matsushima from MS&AD Insurance Group Holdings, Inc. reported that 2018 saw one of the worst years for storm and flood damage inside and outside Japan. She also introduced a new service for customers to prevent risks by sending a warning message regarding extreme weather and providing a map of flood assessment. Eco-system service-related insurance such as coral reef insurance in Mexico was also mentioned as a unique initiative. Finally, Yuki Mori from the Reconstruction Policy Department of Higashimatsushima city (Miyagi Pref.) talked about the reconstruction of Miyanomori Elementary School with support from The C.W. Nicol Afan Woodland Trust. The surrounding area was affected by the 2011 Tohoku earthquake and tsunami, and an ongoing project to rebuild the area into an environmentally symbiotic community was also introduced.